Gionee is all set to unveil two new upcoming phones at MWC 2017. 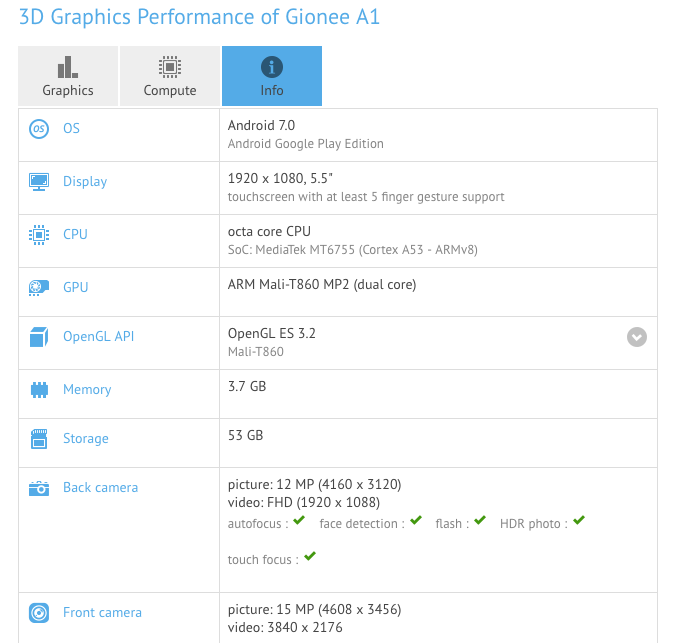 Out of the two, Gionee A1 has now appeared on a benchmarking site, GFXBench. As per the listing, the Gionee A1 comes with a 5.5-inch Full HD display. The phone will be powered by a Mediatek MT6755 (Helio P10) combined with 4GB of RAM. Storage space would be 64GB. The phone runs on Android 7.0 Nougat. A 13-megapixel rear facing camera along with a 13-megapixel front snapper has been added. Apart from this, a 4010 mAh battery is also rumoured. A rear facing fingerprint scanner would be present. The phone will be announced at MWC event and the device is said to be slimmest Gionee phone. A couple of leaked images of the phone have already on the internet. A couple of days back, the Gionee A1 was appeared on another benchmark site, Geekbench revealing octa-core processor, 4GB RAM, and Android 7.0 Nougat.